Nathan Conway, Owner/Driver of the #40 car for the Conway Racing Team has been attending races since he was a child. What started out as a way for his parents Wilbur and Agatha to entertain a youngster, quickly grew into a passion for a great American sport. During the late 70’s and early 80’s Nathan’s father competed as a drag racer as well as ran some dirt track races with his friends. This was a big inspiration for Nathan, and even though he leaned more to the stock car side, he still has a love for all motorsports. For over seventeen years he has been involved in the sport of dirt track stock car racing, either as a crewman and then later transitioning as a driver. He started out in the pits as a teenager doing whatever he could for other drivers whether it was helping change tires or just hand tools when needed, he learned at a young age that the smell of the gasoline and grease under his nails was what he needed from life. Flash forward to 2001, he made the jump from pit crew member to driver and ran his first race at Kentucky Motor Speedway. Spending time mid pack, Nathan wasn't deterred from the sport and he soon after started building and driving his own cars throughout the next several seasons, taking knowledge he learned from other drivers and crews to improve on his driving abilities. Present day, finds Nathan driving a 1985 Chevrolet Caprice Classic with a 355 small block Chevrolet engine, carrying his traditional colors of Silver and Red, inspired form the Sterling Marlin cars of the 2000’s. As competitive as Nathan can be he realized that this sport is only driven by the people in it and their love for racing so he knows that if he can help an up and coming driver with his knowledge or be there to answer questions for friends and fans alike, it's something he loves doing. He's passionate about racing has already proven himself on the track with one feature and 12 heat wins in the book. There are many tracks that he races at locally such as, Windy Hollow Speedway, Cedar Ridge Speedway and Western Kentucky Speedway. He is most excited about getting the opportunity to run at Paducah International Raceway, Duck River Speedway, Bloomington Speedway, and hopefully one day get the opportunity to race at the Talladega Short Track. 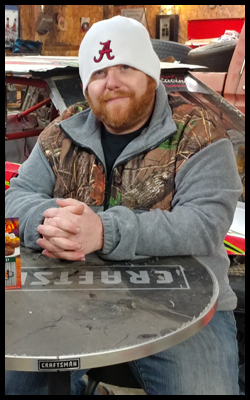 For the 2018 season, Nathan is excited to get out and meet more fans and build a bigger base in the area to show that dirt track racing is a sport for the whole family. Nathan has a goal to bring one new fan to the track at every race, because if we can keep exposing new people and turning them into fans, we can keep the sport alive and well!